Some people enjoy spending time inside of their own thoughts, making them more self-aware people. There are others who avoid their own thoughts and feelings out of fear, which can cause them to lack self-awareness. 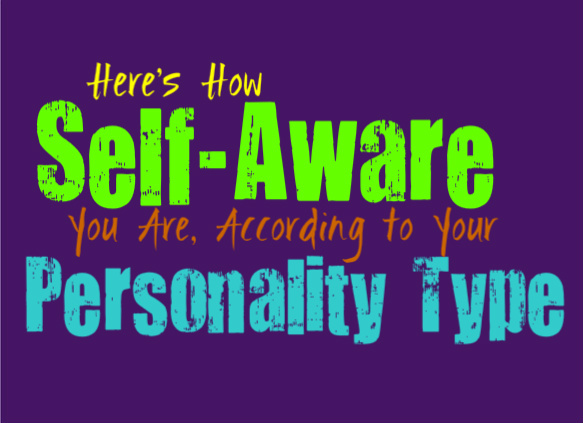 Here is how self-aware each personality type is most likely to be. INFJs are very focused on the needs of others, because they are naturally in tune with other people’s emotions. The fact that INFJs are so acutely aware of the emotions of others, sometimes causes them to lack insight into their own feelings. INFJs do however take a lot of time for introspection, especially since they are private people who enjoy alone time. When the INFJ is alone they often love exploring their own vivid and active inner minds, and can spend hours diving into their own thoughts. The INFJ often understands certain parts of themselves very well, but they can be a bit hard on themselves. They don’t always see themselves clearly, since they might have a tendency to see the worst. ENFJs has a natural and powerful awareness of the emotions of other people. They can often sense when someone is upset, and are excellent at analyzing and understand them. While ENFJs are naturals when it comes to understanding others, they sometimes struggle to appreciate their own emotions. The fact that ENFJs are so focused on other people, can cause them to forget to pay attention to their own needs. They can often lack self-awareness with certain things, simply because they feel guilty when they focus too much on themselves. Prioritizing other people causes the ENFJ to lose sight of their own qualities sometimes, making them lack self-awareness and sometimes be hard on themselves because of it. INFPs are introspective people, who spend a lot of their time inside of their own minds. INFPs are extremely aware of their own emotions, morals and needs. They spend a lot of time figuring themselves out, which makes them very secure in their ideals and beliefs. INFPs are certainly self-aware about a lot of things, and as they get older become even more aware. When the INFP matures they are skilled at recognizing their own positive qualities, as well as their faults. Knowing their flaws helps the INFP to better themselves, and become more comfortable with who they really are. ENFPs are enthusiastic and eager people, who enjoy being able to experience new things. ENFPs do spend a lot of time inside their own minds, which causes them to be rather introspective. They like to sift through their thoughts and feelings, and work to better understand what they truly mean. ENFPs are certainly self-aware when it comes to their emotions, even if they aren’t comfortable openly expressing them to others. They are aware of their wants and desires, and especially their personal morals. There are certain things that the younger ENFP might not be fully aware of, but as they get older these blind spots should get worked out. INTJs are introspective and intelligent people, who focus on learning as much as they can. Their minds are constantly running through different thoughts and new ideas. INTJs are certainly self-aware when it comes to their wants and goals in life, and their sense of morals. When it comes to their own emotions, INTJs can be a bit unaware. They often repress certain feelings, since they prefer to focus on what is logical over emotions. This can cause the INTJ to actually be a bit unaware when it comes to their own emotions and feelings. They strive to grow and be as self-aware as possible, which they are certainly capable of, they just struggle when it comes to their feelings. ENTJs are hardworking and driven people, who are constantly searching for growth. Their desire to better themselves makes the ENTJ work towards being more self-aware. They dislike feeling ignorant, and this even includes being ignorant about their own faults. ENTJs want to be logical about their positive and negative traits, in order to properly find ways to better themselves and grow. Where ENTJs can sometimes struggle is when it comes to their own emotions. They will often bury their feelings in order to focus on what makes reasonable sense, which can leave little room for introspection towards their emotions. ENTPs are outgoing and intelligent people, who love learning and growing. ENTPs dislike being ignorant about themselves, and don’t pretend to be anything they are not. They are perfectly comfortable with their flaws, and strive to understand themselves as best they can. ENTPs spend their time and energy trying to grow, and always want to be open to learning something new. They are eager to partake in things that make them a bit uneasy, and don’t mind the hurdles of true introspection. ENTPs are often self-aware about a lot of their qualities, but might struggle when it comes to diving into their emotions. They can be a bit hesitant to explore their own feelings, but this is usually a skill that they develop as they mature. ISTJs are hardworking and intelligent people, who strive to learn and grow. ISTJs are always trying to be the best at what they do, and will push themselves rather hard. ISTJs do struggle when it comes to being aware of their own emotions, and prefer to focus on practical things. They are hardworking people who can actually be hard on themselves when it comes to most things. They aren’t always self-aware, since ISTJs have a tendency to focus hard on getting things done, instead of giving themselves credit where it is actually due. ESTJs are focused and driven people, who are always trying to be the best versions of themselves. They can sometimes appear rather overconfident, but part of this is just to ensure that people take them seriously. While ESTJs are caring and hardworking people, they can struggle when it comes to self-awareness. They are certainly always trying to better themselves, but this can actually cause the ESTJ to be too hard on themselves. They aren’t always skilled at being introspective, and will often miss some of their own negative and positive traits. ISFJs are introspective people, which means they try to work on self-awareness. They do have a hard time with this sometimes, especially since ISFJs are mainly focused on tending to the needs of others. This constant desire to care for everyone else, causes the ISFJ to ignore their own emotions and needs. ISFJs also have a perfectionist nature, which often makes it hard for them to face some for their flaws. They don’t always see themselves correctly, simply because they spend too much time tending to everyone else to pay attention to themselves. ESFJs are very focused on the emotions of others, which can cause them to lack self-awareness. ESFJs are so focused on trying to be perfect for everyone else that they sometimes forget who they are and want they want. They want to be the best they can for their loved ones, and work hard to make other people happy. This desire to be perfect for everyone, causes the ESFJ to miss some of their own negative qualities, and attempt to sweep them under the rug. ESFJs also have a tendency to be internally hard on themselves, even when they should be valuing their own strengths. ISTPs are introspective and very internal people, who spend a lot of their time inside of their own minds. ISTPs enjoy being aware of things, and try hard to be conscious of their own qualities. They enjoy being self-aware and dislike feeling like they are ignorant in any way. ISTPs do have a hard time when it comes to paying attention to their own emotions, and may struggle with self-awareness in that specifics area. They do have the ability to recognize their faults, and are comfortable accepting them. ESTPs are enthusiastic and hardworking people, but sometimes they struggle with introspection. They have a hard time accepting their own faults sometimes, since they can naturally be hard on themselves anyways. ESTPs sometimes judge themselves too harshly, but they will keep these judgments to themselves. They try to be outwardly confident, so that people don’t realize how harsh they are on their own mistakes. ESTPs struggle when it comes to self-awareness, especially when it comes to their own emotions. ISFPs are extremely introspective people, who enjoy spending time on their own. ISFPs actually enjoy diving into their own minds and will spend ours sifting through their thoughts and feelings. ISFPs are very aware of their own emotions, which helps them become self-aware people in general. They are comfortable accepting their feelings, and will spend time figuring out what they mean. ISFPs also have very strong morals and beliefs, which they stand firm on. They know what they want from life, and are not afraid to express this openly. ESFPs sometimes lack self-awareness, since they aren’t very introspective people. ESFPs prefer to live in the present moment, and spend time enjoying life with their loved ones. This desire to soak up the joy around them, sometimes causes the ESFP to lack self-awareness. They don’t always enjoy spending time by themselves and would much rather be with the people they care for. Always wanting to be around other people causes the ESFP to sometimes avoid their own thoughts and feelings.